Fleet Power 1000 (part# 81-0116-12) provides 1000 continuous watts of silent and efficient AC household power from your vehicles DC batteries. When plugged into an electrical outlet, a built-in 50-amp, 3-stage charger automatically charges your batteries without the risk of overcharge. It comes with a transfer switch that automatically selects either an external or inverter power source. It is ideal for powering loads such as motors with high surge. Built for hands-off operation, the Fleet Power 1000 can be used with the optional Fleet Power Remote for on/off control and basic system monitoring. 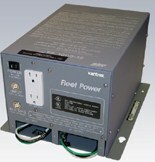 For advanced system monitoring and control, Fleet Power 1000 can be paired with optional Link instrumentation.